Merry, Merry Christmas! 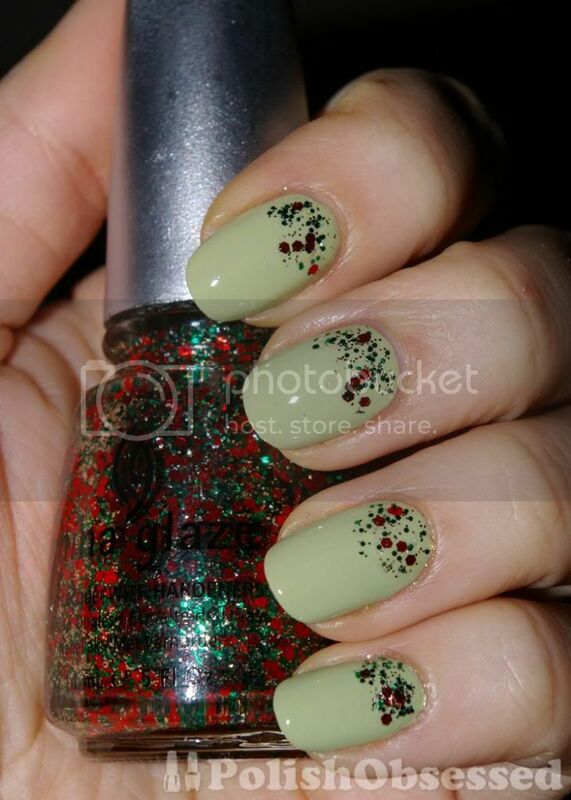 Today I have my Christmas mani which is a refresh of Essie's Navigate Her. This is such a vintage green shade and I found that it was perfect when paired with none other than China Glaze Party Hearty!! I am really starting to put a dent in this polish which makes me sad because I love it so much and don't want it to run out or dry up. I applied Party Hearty at the base of the nail, gently dabbing the brush on the nail bed and softly directing the glitter with the brush. My first attempt at this was with a cosmetic sponge on my pinky and it worked a little too well! The glitter looked a bit too saturated. I think the glitter looks more natural and free flowing when applied with the brush. I really love this look. Last year I was thinking of layering Party Hearty over a light, mint green but didn't have a shade I liked at the time, Navigate Her is a perfect match in my opinion, although not very minty. I love the contrast between creme and glitter. Party Hardy is such the quintessential holiday glitter...I think it's going to stay with me for yrs and yrs to come.